One of the most important discoveries Peter Tudvad made when working on his book, Kierkegaards København (Kierkegaard’s Copenhagen), was that the attacks on Kierkegaard in the satirical newspaper The Corsair, were not confined to 1846, as scholars had assumed, but actually spanned the period from 1846 until Kierkegaard’s death in 1855. This makes Kierkegaard’s continued preoccupation with the Corsair, and its merciless caricaturing of him, appear less neurotic than has been assumed. He continued to be preoccupied with the newspaper because it continued to be preoccupied with him. Kierkegaard was hence not exaggerating when he described himself as an object of public ridicule. The situation was even worse though than scholars have assumed. The Corsair was not the only paper to ridicule Kierkegaard. Another paper, Folkets Nisse (the people’s elf) also published caricatures of or relating to Kierkegaard over an extended period. The drawing above is one such caricature. Apparently, Kierkegaard’s effects were auctioned off after his death. 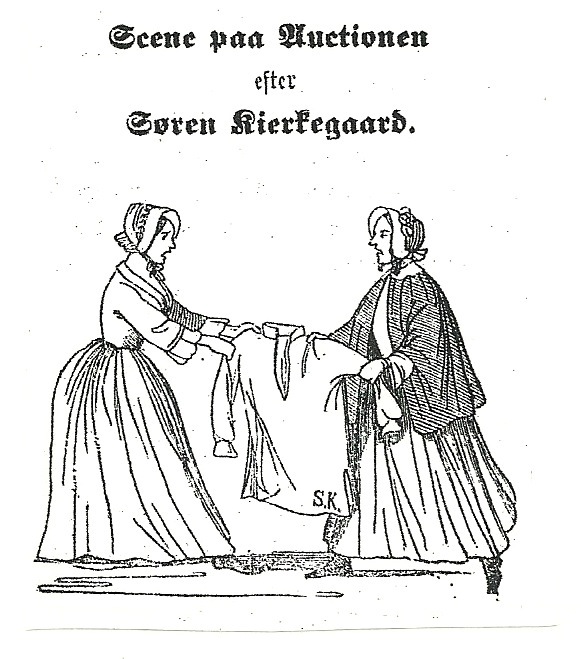 The drawing depicts two women fighting over one of Kierkegaard’s shirts. It’s interesting not simply as an example of a hitherto unknown collection of contemporary caricatures but also because it tells us something about how Kierkegaard was viewed around the period of his death. Scholars have often portrayed him as a marginal figure in Danish history, one whose brilliance was really first discovered beyond the borders of his own country. The drawing makes clear, however, that he had become a kind of cult figure by the time of his death and that there was thus probably far more sympathy with his attack on the Danish Lutheran Church than is ordinarily assumed. There are many more drawings like the one above in Folkets Nisse. I cannot claim credit for having discovered them. They were discovered by Paul A. Bauer in the late 1990s when he purchased a bound volume of Folkets Nisse from an antiquarian book dealer in Copenhagen. I am indebted to Anne Marie Furbo of the The Royal Library in Copenhagen for tracking down this particular drawing which I had remembered only vaguely but which I wanted to use for the cover of my forthcoming book, Fear and Dissembling: The Copenhagen Kierkegaard Controversy. If you plan to go to Copenhagen, stop by The Royal Library. I’m sure the folks there will be similarly helpful to you if you want to track down more of these hitherto unknown caricatures. Your book title is intriguing! As far as the Corsair, that is indeed interesting that the attack continued for longer, but I wonder what the true extent of it was. After the original owner of the paper sold it, the attacks no doubt lessened but it is not surprising that they continued (since at that stage SK was almost a comical figure around Copenhagen). I wonder if there is any mention in SK’s own journal about the continuing attacks, since during 1846 he mentions it (directly or indirectly) quite a bit I think. I assumed the attacks lessoned after 1846, but I have not made a serious study of this issue. I know Kierkegaard complains of ill treatment by The Corsair long after 1846. Again, because I have not made a systematic study of this, I can’t say how specific those complaints are (e.g., whether they refer to particular articles or caricatures). What is more intriguing to me is that he does not mention Folkets Nisse. It’s possible that there were even more newspapers, or other periodicals that ridiculed Kierkegaard. Given that, he appears to have born his public martyrdom with more equanimity than has hitherto been appreciated. Next Next post: M.G. Piety’s Website is Up and Running!